Are you a total kitty fanatic? We all know that cats pretty much rule the internet, right? Well, now is your chance to give your kitty a little taste of the fame they so deserve! All you have to do is try out Tidy Cats® new litter products and send a picture of just how happy it makes your kitty! Read on for details! You know I have three cats of my own, right? Well, boyfriend just moved into a place of his own and was feeling a bit lonely, so we just got him a new kitty companion. When we brought her home, we had to buy tons of kitty items, including litter. I happened to have a coupon for Tidy Cats® Lightweight Litter Instant Action™ so I picked up a jug! 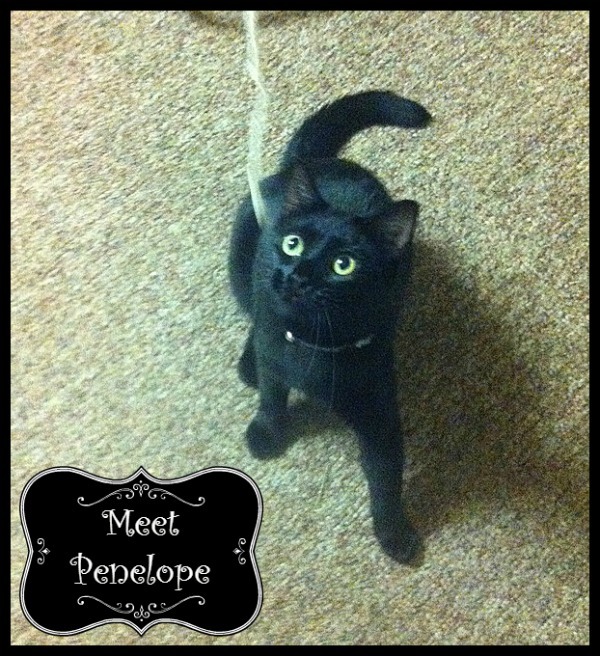 Little Miss Penelope is such a happy girl as it is, but after she gets out of her litter box, she likes to run around like a lunatic, doing a little dance. Penelope is very difficult to photograph. Why? Because she just spent almost three months in a cage waiting to be adopted. She is such a snuggle bunny and really has a lot of cuddling to make up for, I think. I try to get pictures of her, but she just butts the camera with her head. I did manage to snap a few while dangling her favorite toy. It used to have a fish on the end of it, but she took it off! Did you know that now, you can get Tidy Cats® Occasional Cleaning® and Tidy Cats® Lightweight Litter Instant Action™ for immediate odor control and quick pick-ups? Both litters clump quickly to trap in moisture and odor. Then you just remove it in one quick scoop! So easy, and your house will smell fresh! As a life-long kitty person, Tidy Cats® has always been one of my top go-to litters. I’m really excited about the Tidy Cats® Lightweight Litter Instant Action™ in particular, because it just makes hauling the litter so much easier. Plus it keeps Sal’s relatively small place smelling clean and fresh. No Penelope odor anywhere! Ready to have your pretty kitty featured on Purina Pet Park? Just upload a picture of your cat with the hashtag #KittyOccasion to Instagram. Head over to your local Walmart to pick up your favorite Tidy Cats® litter and start controlling odors in your home! 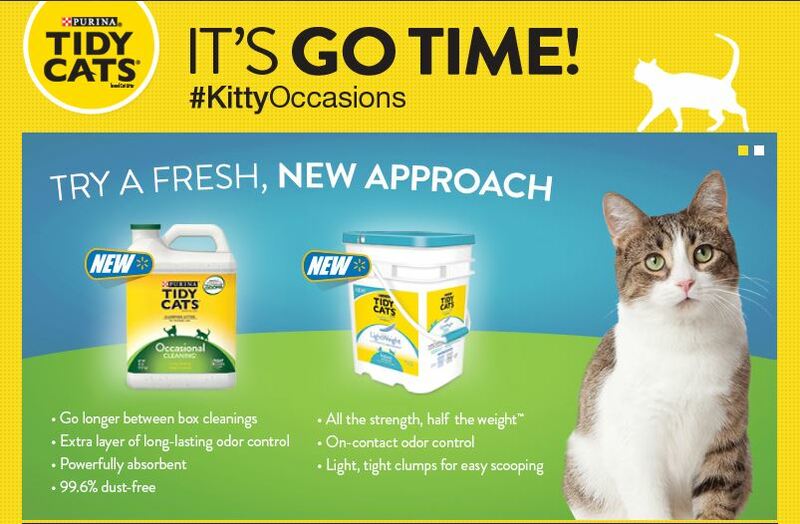 Have you tried the new Tidy Cats® Occasional Cleaning® or Tidy Cats® Lightweight Litter Instant Action™ yet? That picture of Penelope is precious! We’ve always had dogs but I bet there will be plenty of adorable cat photos on Instagram now! Love tidy cats! Haven’t tried those yet but I will look and see if we have them here. Penelope is adorable! What a pretty kitty! Thanks for the info on Tidy Cat. I don’t have any cats but will let my cat friends know! I’ve thought of switching to Tidy cat but my kitties are picky. They will turn their noses up any time we switch things on them. Penelope is such a cutie! We have an active cat that’s hard to photograph, too. I make up for it by snapping lots of photos of the older, slower ones. Haha! What a cute kitty. I don’t have a cat now but years ago when I had one I used Tidy Cat and was satisfied with it. I don’t have cats because my son is allergic but I used to so I understand the importance of having reliable kitty litter. This one looks like it really does the job well. We have dogs and no cats but I love cats. I have a good friend who has five cats and I will pass on this info to her. I think she will find it interesting. I have not tried the new products yet, We have to use dust free litter now. That would be rad to see my cats on the packaging! Penelope is gorgeous. I think Ziggy has a crush on her 😉 We are a Tidy Cat home. I tend to pick it more and more as I find it helps combat odors better than some of the other brand. Oh for cute. I have a pretty black cat as well. Love Tidy Cats! What a gorgeous kitty! Unfortunately, our kitty was ran over last year. 🙁 But we always loved using Tidy Cats over every other brand. It was the only thing that kept the smell away. Hello Penelope! So pretty! We don’t have a kitty right now but I’ve been trying to convince my husband to get one for our family. He is not convinced yet. Purina is the brand we feed our dogs, so I’m sure we’d go with that for our kitty, should we ever get one! Seems like the perfect product for those who have cats!